NOTE: This APP has been developed by passionate Outdoor staff as a personal venture & is not subsidized and therefore $8.99 just covers the APP store fee’s and hosting costs. Please support us! For years, many of us Outdoor Educators and Outdoor Guides have shared our ideas and creativity on different ways to better educate and inspire today’s society and youth. Our desire was to pool these great resources into one simple resource, tailored to all staff working in the great outdoors. A simple yet purposeful resource at your fingertips. 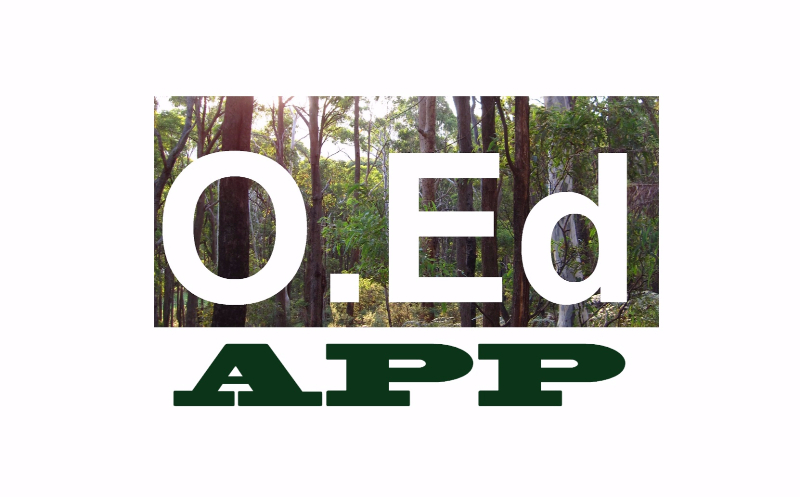 With the explosion of APP’s with their practicality, efficiency and mobility – we knew we had to seize upon the functionability of modern smartphones Well, after a year of toiling, collecting and creating, the ‘Outdoor Ed APPbag of Tricks’ is born! 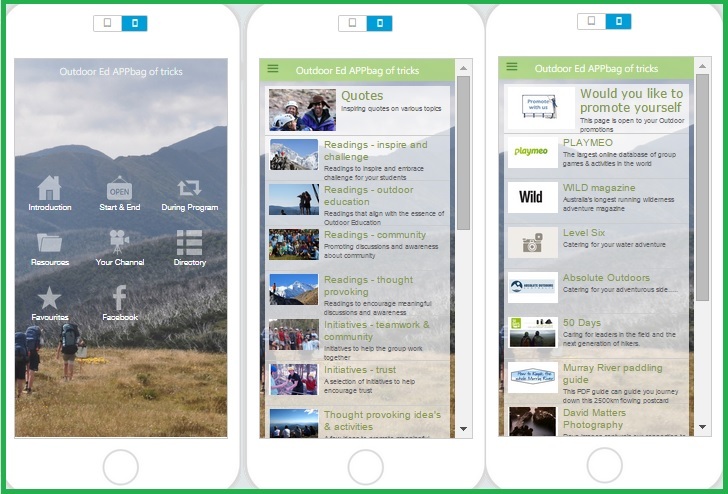 The APP contains a wide range of topics and activities including: Icebreakers, program themes & briefs, readings, quotes, initiatives, solo activities, campfire and fun games, environmental activities, canoe games, thought provoking activities, Aboriginal learning’s, gear checklists, program debriefs, bushfire safety, connection to nature readings & quotes, motivational words & inspiring words (from explorers, adventurers and environmentalists) & more. A glimpse of version 1 is above, do you maybe recognize the Razorback to Mount Feathertop? Our shared goal was to keep it simple, yet with a nice ‘earthy’ feel to it. The APP is a content based ‘native’ APP which means that it will operate without requiring internet access, hence appropriate for wherever you venture outdoors. We have focused on providing (what we believe to be) quality content (with pictures and drawings) in preference of quantity of content so as to not overburden the whole APP. Our desire is to have the APP as a growing resource that all outdoor staff can contribute to, be a part of & take ownership of. In doing so, hopefully we can become more of a collective and a collaborative industry. Furthermore, if interested, we openly invite organisations and businesses to capitalize on some promotional opportunities in the APP. As some have already taken advantage of, we can accommodate business promotion in the dedicated ‘Outdoor Industry Directory’ page. This provides a simple ‘scrolling’ page for you to promote your products and services in relation to the Outdoor Industry. We believe that it will provide great exposure for any business with large organisations already showing interest for bulk purchases. For a small cost outlay and its potential exposure, it should provide a very cost effective marketing opportunity for here in Australia as well as overseas. There is also potential to re-badge this APP as your own organisation’s APP & distribute it amongst your own members or staff or we can create a new content based personalised APP just for your business. If you are interested in any of these options then please subscribe to the O.Ed APP list here and proceed to contact us and we can discuss further details. We can also provide a ‘test’ copy of the APP for your perusal beforehand. Please feel free to join our Facebook page below. All the best, stay posted & we’ll catch you in the Great Outdoors….